A loved-up lesbian couple from Bartlett, Tennessee got a sweet surprise on Friday 25 May when they discovered that they had both planned to propose to one another on the exact same day. 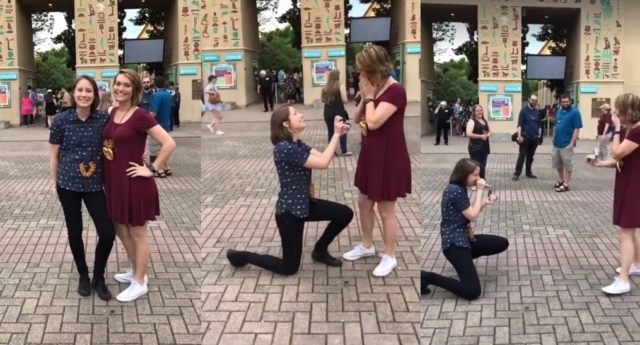 While visiting Memphis Zoo and Aquarium in the pair’s home state, Becky McCabe posed for a picture with her then-girlfriend Jessa Gillaspie before getting down on one knee and popping the question. Shocked, Gillaspie started jumping around before rummaging in her bag and pulling out a ring box – and revealing that she had wanted to ask McCabe to marry her during their day out too. Seemingly, they both had the idea to hopefully kick off their engagement at the zoo, as that’s where they had shared their first date. Complete with added ring and bride emojis, the excited caption wrote: “Becky McCabe and I got ENGAGED Friday night at Zoo Brew!!!!!!! I had no idea she planned to propose, and she had no idea I planned to propose to her! It has since been viewed more than 732,000 times, as of the morning of 30 May, and the figure is rapidly increasing. In response to the couple’s dual proposal, Gillaspie added an updated section to her previous post. It read: “We had no idea this would blow up so quickly! But I can’t say I’m not thrilled, because all I’ve ever wanted was for Beck and the world to know how much l love her. This isn’t the first time something like this has happened in recent months. Back in February, a Texan couple unknowingly planned to ask each other to marry them during a friends and family games night. They even got each other’s families involved but the relatives kept it quiet. Seconds later, Tori gets down on one knee and presents a ring. In response, Berkley laughs and, encouraged by her family to ‘show her’, grabs her own ring box which she was hiding to propose later on in the evening. Well, they do say great minds think alike!